Tobago or maybe Trinidad if full of copycats of the Bob Marley look, or the maybe the Rasta look, this is called dreads. A sort of knotted mass of bunched of hair. I need to take a photo; my Mother and Father will never understand this one. This is dreads; I am not an expert on dreads, having zero desire to not comb my hair for years at a time. I do know there are natural dreads like those that I have seen on the bums in India or many people with dreads will explain or brag about. There is also made dreads, somehow they tease or knot the hair until it creates the globs. I saw a German boy in the Cascada Verde Hostel in Costa Rica putting toothpaste in his hair and leaving it to someway form them. 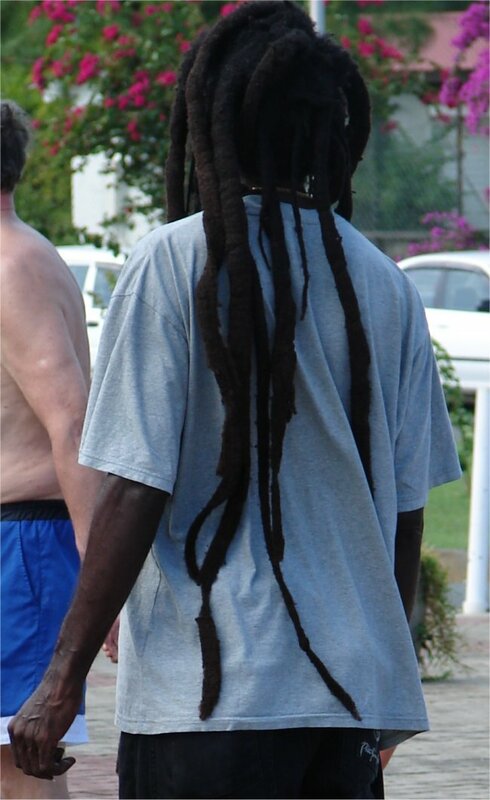 This is very common within the traveler community, mainly forming in the disillusioned, often anti-authority type individuals of the USA and in Germany, most of the other cultures have very little, as I am not sure, I have ever seen a French person with dreads. There is culture, this is part of the framework by which a person wishes to view the world and be viewed by the word. Culture is not a negative or positive, it is many times the fashions that create the culture; it is the identity of the person expressed in how they act, live and behave. This is what I would call braids or maybe cornrows when they are closely cropped or tied to the head. This to me is more rational and expedient, there are many reason for a person to tie their hair. Presently the middle ground is a lesser look, either it shaved or long, I am presently growing the ponytail going towards the long look. The natural curl of an African origin person creates a different way to express fashion with hair. 80 percent of the population probably fits into a middle range haircut, both girls and boys; they keep somewhat a traditional haircut, shorter for men and hanging for women. 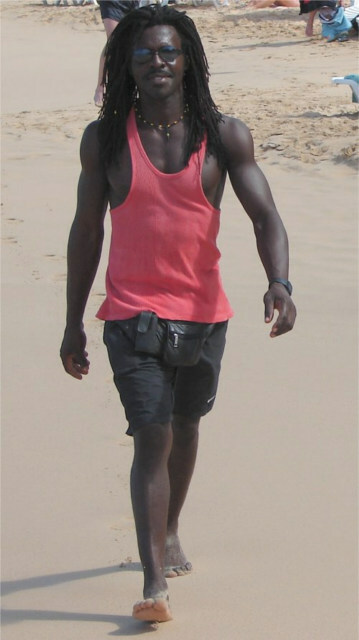 However, there is maybe 30-50 percent in the backpacker traveler community that takes the more dread or rebellious looks of shaving or dreads. I feel that a person must and needs to express themselves in their fashion. I am concerned in the underlying violent behavior or myself or anyone, I term it rage. I see that many underlying sub-cultures have a lot of rage. This is NOT a normal aspect of any culture I know that is mainstream; the rage is more in sub-sets of the cultures. I personally think the Bob Marley culture an aberration of what maybe Bob Marley was often trying to express is damaging a generation. The two quotes above with the - are not me, this is the Encarta Encyclopedia explanation of Bob Marley. What is a person to do with these three concepts, actually the only safe thing to do is to ignore and try to overlook, look the other way, and make no opinion. There is some form of hotbed out there, a group of person that are dangerous, who will enforce or stop any freedom of speech. Freedom is about listening and hearing to thoughts that I agree with, however more freedom is listing to things I disagree with. I am always glad to hear or read comments about the Black Superiority Movements as in the Malcolm X type mentality or the Skin Heads anti-Jewish mentality. I am constantly hoping my world they disappear, however if in my world, what I would think is horrible can exist, express itself, then I know it is possible for more critical problems, for example the beating of women, intimidation of women by men in many cultures can be expressed and stopped. I see confusion in the three quotes from the Encyclopedia above, I look or feel my judgments are best made when I steer my thoughts and make an introspective and invigorated attempt to ask. - Are there obvious truths here -? It is like the near-God experiences or the person who says they have this near-death experience and experienced God. I personally think this is engulfed in hogwash. If you met God, it would not be a question mark moment; it would be - Transparent - as is the buzzword of the day. It would be obvious. There are road of travel, roads of thought, some are the best path, you do not need to ask questions of anyone, you know you are going home; the next step is an obvious step to make. Those who make a cloudy step forward into confusion are responsible for their choices. Bob Marley sang of peace and a clear simple world, he also sang of violence and confusion, anger and rage. Each person will have the temptation to choose their path. I personally believe the road to mental salvation is narrow, less that a 5 percent chance of staying on the -Yellow Brick Road -. Funny stuff, the average person will not travel unless. One of the 3-5 countries they wanted to visit out of the possible 252 countries. What you are trying to say, you do not want anyone around you who says their opinion. I admit, I will do about anything to avoid the Bob Marley bunch, which is easy to do because they do not travel to the truly nice places like the countries of Africa.